Sir, Further to your report “Call for review of ‘flawed’ ME research”(Aug 21), as funders of the Pace trial we reject the view that the scientific evidence provided by the trial for using cognitive behavioural theory and managed exercise in the treatment of chronic fatigue syndrome (also known as ME) was unsound. The Pace trial was funded following expert peer review, was overseen by an independent steering committee, and its published findings have also been independently peer-reviewed. Other research groups have drawn similar conclusions. Chronic fatigue syndrome/ME remains a priority for the Medical Research Council (MRC), and it is important that researchers are not discouraged from working on the disease because of concerns that they could be subject to the level of hostility that Pace researchers have experienced. Medical research can only flourish when there is mutual respect between all parties. There have been other responses from patients. Here is mine, which I decided to send directly to Prof Watt. Like many patients with M.E. I was surprised and disappointed by your letter to The Times wholeheartedly supporting the PACE trial. There are so many misconceptions in the letter that it is clear that you have not investigated this matter yourself but have – apparently- assumed that what the PACE authors tell you about it is correct and what patients tell you is not. I can only assume that this is because they are doctors and we are merely patients. Yet you say in your letter that ‘medical research can only flourish when there is mutual respect between all parties’. I would certainly not disagree with that. Please then show patients the respect of being open to the possibility that what we (and indeed many distinguished researchers and other informed parties) say about PACE may actually be correct. I am not asking you to take us at our word, but please look into the matter yourself instead of simply believing what you are told by the PACE authors and their friends. It will not take you long. I have provided a few references at the end of this letter which you will find useful. For the sake of the patients you say you wish to respect, please take the trouble to do this. Journal of Health Psychology Vol 22 No.9 Aug 2017 – A Special Issue on PACE. “On the basis of this Special Issue, readers can make up their own minds about the merits and demerits of the PACE Trial,” writes Editor David F Marks. A letter to The Lancet signed by over a hundred scientists, clinicians, academics, MPs and other experts plus over sixty local, national, and international patient organisations, calling for an independent re-analysis of PACE and setting out the reasons why. 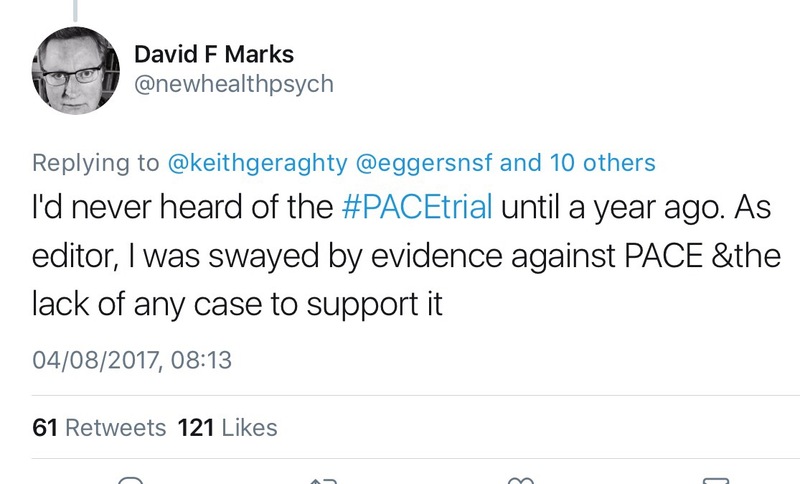 The August 2016 PACE Trial Freedom of Information Tribunal Judgement has useful information about so called hostility to PACE researchers, an unfounded allegation which your letter unfortunately perpetuates. Your letter also suggests that researchers might be ‘discouraged from working on the disease because of concerns that they could be subject to the level of hostility that PACE researchers have experienced’. The idea that researchers are being discouraged in this way is another often repeated misconception which seems to be intended to vilify patients. Working for the MRC, you will be fully aware of how little funding M.E. has received over the years. Nevertheless there is research going on worldwide, strongly supported by patients and often funded by them. (Many of these researchers are critical of PACE and have signed the letter to The Lancet requesting its independent reassessment – see above.) Patients do however object – in the form of letters such as this and other peaceful means – to the squandering of funds on poorly conducted research such as PACE, money which is desperately needed for high quality biomedical research into the condition. Anyone reading through the numerous posts on this site could get the impression that nothing encouraging ever happens in the world of ME. Well it often seems that way, but good things do occasionally come along and I have to admit, if I’m honest, that these posts are more likely to be bearers of bad news than good because I’m more likely to pick up my tablet and write about something which has annoyed me. Having moaned so much about journalists last time, however, it seems only fair to redress the balance by reporting when one of them has done a good job. So congratulations to Tom Whipple of The Times for a well informed article on the review of the NICE Guidelines. Thanks also to the ME Association for providing a way round the paywall – and to Dr Keith Geraghty who appears to have been instrumental in setting this article up. I really hope we can look forward to further reliable dispatches from Tom in the future. There’s a lot of opportunity in the ME field for any journalists who are willing to consider taking the trouble to get to the truth. And speaking of NICE, the decision to review the guidelines after all came as another piece of good news. Bearing in mind the information available, the revised advice in the USA, the petition with 15,000 signatures, and the Early Day Motion in parliament, you might have been forgiven for anticipating a change of mind at NICE, but we’ve got so used to having our sensible arguments ignored, that it came as quite a shock when it actually happened. 2) No mention was made on the programme of the severely affected, who comprise about 25% of patients with ME/CFS. The vast majority of these are permanently housebound or bedbound. Many are unable to even sit up in bed, tolerate light, or converse with their loved ones. Most of these receive no medical attention whatsoever as GPs often refuse to visit them. Most doctors do not believe that people ME/CFS can become so severely ill, and wouldn’t know what to do about it even if they did. 3) The first forty minutes of the programme were excellent so it was disappointing that you gave five minutes at the end to Prof Crawley with no one to challenge her. She is one of a small group of UK doctors who have built a career on poor quality, misleading research which has only led to confusion in the field. Her latest paper on the lightning process is an example of this but there have been many others. Studies such as these (and the PACE trial itself) are misleading for numerous reasons but one of the problems is that many of the patients selected do not have ME/CFS at all but fatigue due to other conditions such as depression. Many of these will respond well to graded exercise or possibly the lightning process, ‘treatments’ which are harmful to people who really have ME/CFS. This would not be a problem if efforts were made to clearly distinguish between the different types of patient but Prof Crawley persistently fails to do this, conflating patients with ME, CFS and generic fatigue. These days she is frequently in the media, much to the dismay of many patients. We have noticed that there is never anyone to challenge her point of view. Why not? It would have been interesting to listen to Dr Shepherd in conversation with her, for instance. I hope that if you cover the subject again, Prof Crawley will not be allowed to go unchallenged. Notwithstanding the above, your programme was like a beacon of light amid a sea of misinformation about our condition. Thank you for producing it. P.S. Yes, I know I’ve conflated ME and CFS myself. Sorry. But it seemed best to write using the same terminology they used on the programme. Advance notices for ‘You and Yours’ spoke of ‘chronic fatigue’ but it seems that someone put them right on that one. By the time of the actual programme they were saying ‘ME/CFS’. At least that’s some progress. As you may know, a few days ago the Journal of Health Psychology published a very important special issue critiquing in depth the controversial, deeply flawed PACE Trial, a study which purported to provide evidence for the use of graded exercise and a very specific type of CBT in the treatment of ME (myalgic encephalomyelitis, also known – misleadingly – as chronic fatigue syndrome or CFS). Congratulations to the journal’s editor Prof David F Marks for taking the trouble to inform himself about the true situation regarding ME. He is one of very few scientists and health professionals who despite having no personal or pre-existing professional interest in the condition has made the effort to look at the facts and realise that – unlikely as it may seem to many – the PACE Trial and similar ‘research’ into ME by those with a fixed biopsychosocial mindset really is every bit as flawed, misleading and potentially damaging as patients have been claiming for years. Dr David Tuller, Prof James Coyne, and Prof Jonathan Edwards are other rare free thinkers who have not been afraid to get informed and challenge the status quo – or to put it another way, to point out that the emperor is naked because that is what he is. By contrast, those who persist in defending PACE give the impression that they have simply taken the word of the PACE investigators rather than study the actual evidence. Prof Malcolm Macleod, who was trotted out by the Science Media Centre as an ‘expert’ in response﻿ to the special issue, seemed only aware of one of PACE’s many flaws and seemed to base his defence of the study chiefly on the ‘doubtful provenance’ of some of its critics. It is another example of people being judged on the basis of who they are, rather than what they say or where the truth lies. As for Prof George Davey Smith, who left the JHP’s editorial board in protest at the PACE-related special issue, he seemed to positively gloat about his ignorance of ME at last year’s CMRC conference, this in spite of his involvement with the much vaunted though controversial MEGA study, and even referred to it as CSF rather than CFS, apparently mixing up chronic fatigue syndrome with cerebrospinal fluid. Speaking on Twitter, David F Marks described his disappointment that George Davey Smith did not ‘offer a pro-PACE commentary instead of leaving in a huff’. He (Marks) has offered to debate with PACE supporters in a public forum at any time. I don’t suppose he’ll get any takers. That would put them to the trouble of actually sitting down and informing themselves of the true situation. Marks, meanwhile, has studied the facts and has drawn his own conclusion. He says: ‘“The many wrongs committed by psychiatry and medicine to the ME/CFS community can only be righted when the Pace trial is ultimately seen for what it is: a disgraceful confidence trick to reduce patient compensation payments and benefits.’ To which I would add: ‘also an exercise to try to protect the reputations of a small number of health professionals who have built their illustrious careers on the back of an unproven ‘biopsychosocial hypothesis’. Meanwhile the proponents of PACE continue to take the cream of the research money here in the UK, so inhibiting much-needed biomedical progress; unsuspecting patients are given potentially damaging courses of graded exercise; and the number of parents threatened with ME-related child custody proceedings appears to be spiralling upwards, all this fuelled by the unproven biopsychosocial hypothesis. As The Times article reported with great relish, James Coyne allegedly called the departing Davey-Smith ‘a disgusting old fart neoliberal hypocrite’. This may seem a little harsh but if language like that helps to get the truth about PACE in the newspapers, then so be it as far as I am concerned. And in view of the human suffering which underlies the farce that is PACE, perhaps such language is restrained. Note: David Tuller’s response to the Science Media Centre’s ‘expert comments’ on the JHP special issue is here. Does Esther Crawley’s latest research really tell us anything about the prevalence of pediatric CFS/ME? After a quiet time over the holidays and into the new year, ME/CFS has been back in the news again. This time the coverage has in many ways been rather helpful. Dr Mark Porter, writing in The Times painted quite an accurate portrait of the condition: usually starting after an infection; involving numerous symptoms rather than only fatigue; the fatigue itself “persistent and recurrent”; and “exacerbated by physical or mental exertion”. There was even a description (though not by name) of the all-important post-exertional malaise. Pacing was also well described: “some of the strategies are counter-intuitive”, “it is important to avoid the boom-and-bust cycle”, only the exhortation to avoid daytime sleep seemed to me to be off the mark: in some situations this is a useful strategy to restore natural rhythm but in my experience as a patient it’s not always feasible or desirable. Nevertheless I liked Dr Porter’s perspective on the possible psychological repercussions of having ME: “feeling awful for months on end will dampen the spirits of the hardiest person” and severe ME at least gets a mention: “when severe it can leave victims housebound and often bedridden (the worst cases require hospital treatment)”. Not that the hospital is likely to have a clue what to do about it but at least there is some acknowledgement of severity. The piece on the BBC News website focused more on the new study from the University of Bristol which served as the trigger for this latest splurge of publicity. Chronic Fatigue Syndrome at Age 16 Years claimed that the prevalence of pediatric CFS was 1.9% in 16-year-olds, higher than previously thought. The BBC article rounded this up to 1 in 50 and contrasted it with the 1 in 1000 (it said) who are actually diagnosed. Hmm. The study also claimed that CFS affected almost twice as many girls as boys at age 16 and was more likely to affect children from disadvantaged backgrounds. According to the article, the study authors said this dispelled the commonly held view that CFS/ME was a “middle-class” illness, or “yuppie flu”.